This is where I share some of my FAVORITE gadgets, tools, and small appliances. I may have received some of the items as part of a promotion at one point or another and some I have purchased...but I am only sharing the things I LOVE here! of Sandra Lee's Collections at Sears and Kmart. One of the many perks of the visit was the opportunity to take home some items from Sandra's collection. I happened to be hanging out right by this grill when the time came for all of us to pick out products and snatched it up (amazingly there was room in my suitcase for it!). When I returned home I could not wait to try this grill out. 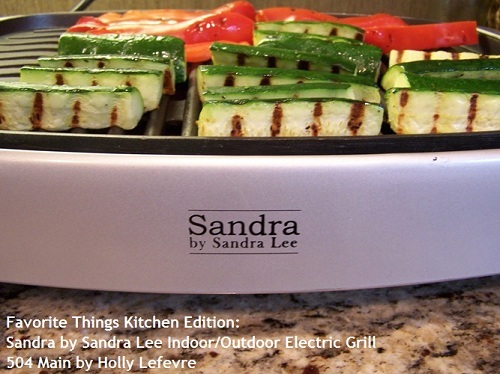 THE SANDRA BY SANDRA LEE INDOOR/OUTDOOR ELECTRIC GRILL IS AMAZING! I use this grill almost daily. Hubby uses it for grilling meat. It grills the food so nicely. It even has an adjustable heat dial...LOVE! this is so convenient to have in the house! I get my grilled veggies any time I want and also get perfect grill marks! but you can also use it outside, just a little help for that big BBQ! it is a great tool for letting him help make dinner. A huge bonus is that it is EASY to clean up. the top part comes out and the cord/heat probe is removable. Yo can even pop this in the dishwasher. I just hand wash mine though. So, let me tell ya, this grill is a treat! It is a staple in my kitchen routine! you can enter to win one of these beauties too. Trust me - you will love it! for more details and product specifications. open to shipping addresses in the continental U.S. Opens 9/25/12 and runs through 10/4/12. NOTE: I am using Rafflecopter right now for my giveaways. You can enter by logging in with Facebook OR by using your email. The only mandatory entry is to leave a comment. disclosure: I did receive this grill for free back in April...but this post is written purely because I love it. Sears is providing one grill for the giveaway. I love to grill everything but I might settle on grilling meat. Meat just tastes so much better when it is grilled! Those veggies look toooooo good!!! We fix tons on the grill, but my fav has to be veggies, a sweet onion wrapped in foil, unwrap and its super soft, super sweet!! I would grill veggies with garlic salt....yum!! A grill where you can actually wash it without worrying about ruining the machine. Cool! How fun that you got to go to the event! I'm so jealous! I like it all grilled... but... we have a big honking thing outside that I don't like to use. I would LOVE to have this in the house to use! I love to grill vegetables and chicken. Yum! Holly, I saw her use this thingie the other day. I think egg plant and other squash are great on the grill and what a treat. Will this help me look as adorably coordinated as Sandra too? No? Ok, well I want it anyway! 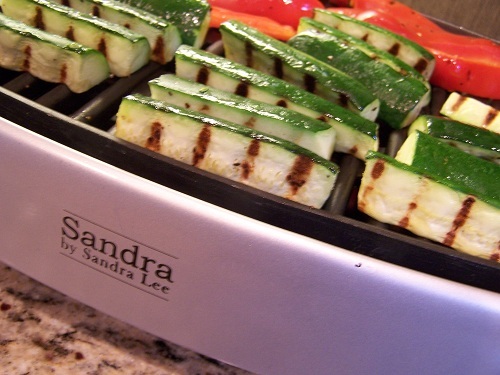 I love grilled veggies, but am afraid to use the gas outdoor grill so this would be a great tool for me! Thank you so much for this post. I want to let you know that I posted a link to your blog in Creative Busy Bee Craft Inspirations, under the Page 3 post on Sep. 26, 2012. Thanks again. What a great way to prepare veggies. 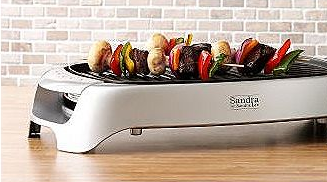 My experience with an indoor grill is limited to George Foreman- but this looks awesome! I love when my husband grills meat, chicken, mushrooms...okay...I love just about anything grilled! My favorite things to grill is pineapple... but my hubby sure make a great jalapeno burger on the grill. I love to grill everything - veggies, fruit, chicken, pork - yum! Everything . . . but my favorite thing to grill is shrimp. Grilled zucchini is my favorite grilled food! Pretty typical, but we grill the hell out of chicken. We cook a week's worth at a time and put it with everything! Would love to have an easier time grilling things for my boys! Pick me!!! I like to grill veggies, and fish. I love to grill Pizza and veggies! oh I'd have so much fun with this! I don't grill outdoors without the hubs so this is perfect for me. I'd start out by grilling my favorite teriyaki chicken! I love everything off the grill - burgers, hotdogs... and especially steak! We love to grill! Usually we just do our main entree - but I'd love to try some new things with this - like fruit or pizza! Veggies usually but I bet that would make awesome grilled peaches. I love grilled veggies, but the sound of grilled peaches (topped with vanilla ice cream) sounds even better. What a great giveaway! I would like to know on the knob it has min to 5 but what I would like to know what temps each number goes to. In the book it tells you what temps to cook it at but there are no temps on the grill just 1 thru 5. Email me at katrina19732000@yahoo if anyone knows.